Countertop protection film protects all surfaces from construction debris, excellent for protecting laminated plastic, tile, vinyl, granite, and glass. When there's any kitchen construction always use protection. 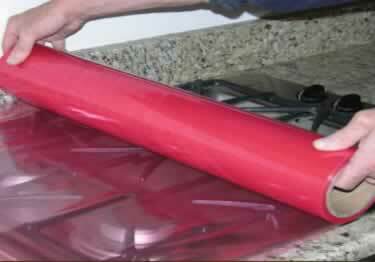 Just purchased the red countertop surface protection film. I could not find any specs that suggest the maximum length of time that the film can be applied to the surface. Is there any time specified? 30 days? 60 days? Thanks for getting back to me. Countertop protection film protects all surfaces from dirt, grime and spills, excellent for protecting laminated plastic, tile, vinyl, granite counter-tops, appliances, and glass.